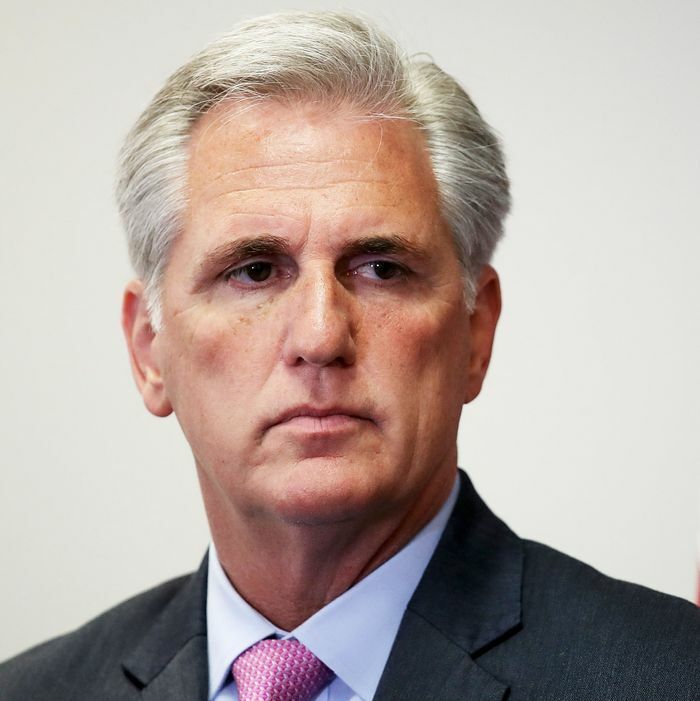 Lose the House, Lose Leadership for GOP’s Kevin McCarthy? Will Losing the House Bring Down Kevin McCarthy? Even as it struggles for survival against a possible Democratic “wave” election in November, the House GOP has its own internal leadership issues to sort out. The retirement of Paul Ryan as Speaker (announced in April) will generate a postelection leadership shuffle in which Kevin McCarthy, the second-ranking House Republican, is the putative successor. But a quiet campaign by House GOP whip Steve Scalise to make himself available if McCarthy stumbles, and an open challenge from hard-core conservative Jim Jordan, show that McCarthy doesn’t have the gavel quite within his grasp. And the open question is whether an adverse outcome in the November midterm elections could make the Californian’s colleagues restless enough that he get tossed over the side along with Ryan’s gavel, which would presumably be wielded again by Nancy Pelosi. He has spent his August trekking across the country, campaigning with embattled candidates in multiple states, adding to a fundraising haul that already exceeds $40 million for the election cycle and doling out advice, encouragement and occasional ultimatums to the Republicans who will determine whether the GOP will hold on to its precarious 23-seat majority. If he is successful, McCarthy is confident he will have a bulletproof case for the speaker’s gavel: With the head winds of political history, an unpopular president and an energized Democratic electorate standing against the GOP, no one did more to keep Republicans in power. But that exposure also increases the risk that a party defeat could be personalized for McCarthy, and open a path for the very popular Scalise if not the more controversial Jordan (or some other ambitious back-bencher). Despite solid support from Ryan and a good relationship with Donald Trump, McCarthy’s right flank remains exposed. Mistrust among conservatives, after all, derailed his last speakership campaign in 2015. But might not losing the House reduce the pressure for ideological rigor as the GOP sought to “move to the center” to regain marginal seats in 2020? No, almost certainly not. A House minority girding up its loins to do battle with Democrats on Donald Trump’s behalf isn’t going to be in a “moderating” mood. And more generally, for today’s Republicans, electoral setbacks are never attributed to too much conservatism. Add in the fact that a scapegoat-searching Donald Trump might throw “my Kevin” under the bus at the drop of a hat if Republicans lose the House and you have a perilous landscape for Ryan’s designated successor. In fact, even if Republicans narrowly hold onto the House, McCarthy could be in trouble, since that scenario would almost certainly increase the intra-party leverage of the House Freedom Caucus. While political forecasters increasingly see worrying signs for Republicans, with some declaring it likely that they will lose their House majority, McCarthy insists the party is not facing anything akin to the 63-seat Republican landslide he helped orchestrate in 2010. Instead, he’s fond of pointing to 1998, when Democrats picked up seats despite a scandal-tarred President Bill Clinton, thanks to a strong economy and GOP missteps. That sort of pre-spin can be dangerous, too, setting expectations that Republicans probably cannot meet. All in all, McCarthy is probably wishing he could just go to sleep and wake up on November 7. Election Day could well be a challenge for him. Will Losing the House Torch McCarthy’s Bid for Leadership?